St. Joseph's College is a Catholic educational institution in Colombo, Sri Lanka. It was established in 1896 by French missionaries, with Rev Christopher Ernst Bonjean playing a leading role. The college has over 4,000 students with a staff of over 200. Distinguished former students include Cardinal Thomas Cooray the first Cardinal from Sri Lanka, President Ranasinghe Premadasa and Niranjan Deva-Aditya, the first person in history to be born in one continent (Asia) and elected to parliament in another continent (UK). The motto of the college is In scientia et virtute meaning "In Knowledge and Virtue" in Latin. In the year 1892, the idea of a Catholic College emerges with the proposal of the Archbishop of Colombo Rt. Rev. Fr. Christopher Bonjean. In the year 1892, on the 6th January, a pastoral letter was sent to all the priests espousing the desirability of building a Catholic College at St.Mary's College premises at Mattakkuliya. In April 1892, a public meeting was held to collect funds and discuss the plans for the Catholic College. Thereafter 27 acres of land called the ‘uplands' was bought by the Archbishop for this project, from the government. Later however, this land was bought back by the government with compensation, and the Catholic Church bought a land at Maradana in Darley Road from an Egyptian called Arabi Pasha for the College building. On the 12th December 1894 the foundation stone was laid by the papal delegate for Asia Rev. Msgr, Zalesbbi. In the year 1896, on the 2nd March 1896, St.Joseph's College Colombo was declared open with 211 students in the school proper and 96 students in the preparatory school with Very Rev. Fr.Charles Collin as the First Rector. In November 1896, on the 2nd March, the College building was formally declared open by Governor of Ceylon West Redgeway and was blessed by Most Rev.Msgr, Zalesbbi, in the presence of the Archbishop Rt.Rev.Fr.Melizan O.M.I. The Rector ‘s office, the College office and the class rooms were all housed in the 1st building – the Clock Tower building of the College. The College Magazine was started in the year 1905. The Bonjean Hall was the 3rd building to be completed. Fr. Charles Lytton, the 2nd Rector, planned and supervised the building project of the Bonjean Hall. Fr.Emil Nicholas O.M.I. was the 3rd Rector appointed in the year 1910. To Fr.Emil Nicholas goes the credit of primary work on the 1st Religious Association of the College – the Guild of the Immaculate Heart of Mary. In the year 1914, there was the appointment of the great educationist, scientist and efficient administrator Fr.Maurice J.Legoc O.M.I. the 4th Rector. In the year 1933 the present Primary building – originally named "The Maurice Block" was constructed. This building was an exact copy of the Bonjean Hall was declared open by Most Rev. Fr.Marques. The next massive building was the (south Wing) a two storied building to house the class rooms. During Fr.Maurice Legoc's tenure of office, there was emphasis of the science subjects in the curriculum, Fr. Legoc's favourite subject was Botany. His own publication "Tropical Botany" was used as a text book in O' Level classes in India and Sri Lanka. On the 19th March 1929, the foundation stone for the College Chapel was laid by the Archbishop of Colombo. The College Chapel is a fitting memorial to Fr. Maurice Legoc. The southern end of the Primary building an exact copy of the Grotto in Lourdes was built. In the year 1940, the Very Rev.Fr.Peter A.Pillai (5th Rector) was appointed. In the year 1947 – 27 February, due to the World War 2, the College buildings were taken over by the Army. The College was in ‘exile' from 1942–1946, branches of the College were housed in Homagama, Kalaniya, Gampaha and later at Borella. On the 30th July 1952, the swimming pool was declared open by Lord Soulbury, the Governor General of Sri Lanka. After the era of Fr.Peter A.Pillai, Rev. W.L.A. Don Peter (6th Rector) was appointed as the Rector of St.Joseph's College in 1959. Fr. Don Peter was the first diocesan priest to hold this responsible post. In 1960, after the take over of the schools by the Government the financial support was stopped by the government. The College became a private, non fee levying school. To uplift the financial situation of the College, Fr. W.L.A. Peter founded the Welfare Association, and also started a pre-school for St.Joseph's. After the tenure of the Sinhala scholar,Fr. W.L.A. don Peter, Rev. Fr. Mervyn Weekakkody (7th Rector) was given the task of being Chief Executive of St.Joseph's. After a brief period, Fr. Weerakkody retired as Rector and in 1974, Rev. Fr. Quintus Fernando (8th Rector) was appointed as Rector. Fr. Quintus Fernando was called the architect of the green revolution at St.Joseph's . He gave pride of pace to agriculture. The Agro '74 was a great exhibition which displayed agricultural plots and stressed the importance of agriculture in the school curriculum. The school functions as an "assisted school" with substantial state funding but mainly from its old boy unions worldwide. Situated in the heart of the city, its set of buildings cover 12 acres (49,000 m2) and comprise a sports complex, and a swimming pool that is built to Olympic standards. The school prepares students for local Ordinary and Advanced Level examinations in Sinhalese, Tamil and English Mediums. In 1996 the latest branch school of St. Joseph's College was opened in Enderamulla, Wattala, 15 km from Colombo. 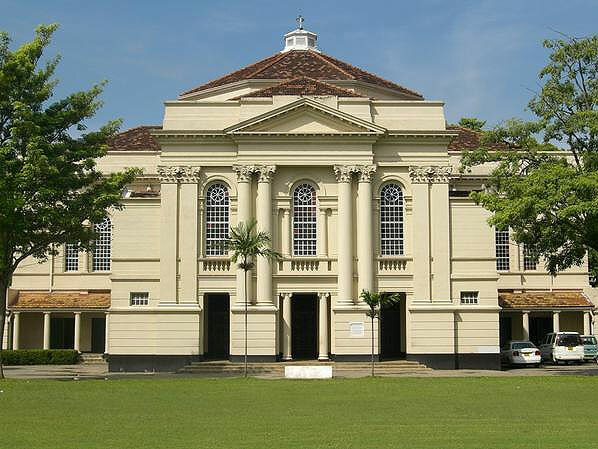 Another branch school that has become a leading Catholic school in the country is St. Peter's College, Colombo. Previously known as St. Joseph's South, it was built to cater to the families in the southern part of Colombo who failed to admit their sons to St. Joseph's Colombo, which has now become their main rivals and compete in sports and other activities which are known as "Battle of the Saints" in Sri Lanka. In 2009 St. Joseph's won the battle after 30 years.